"That place?" 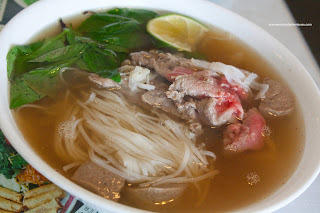 is what both Kaiser Soze and JuJu exclaimed when I suggested we do Pho at Cuu Long. That place has been around as long as I can remember. I keep driving past it; but have never stopped to eat there. I've even spotted people I know walking in while driving by. So after hockey, we decided to give the place a try despite some apprehension. It's not much to look at from the outside and the same goes for the inside. However, it is clean and well-kept though. The first thing that struck us was the genuinely pleasant attitude of the staff/owners. We felt welcomed and very comfortable right away. Kaiser Soze waffled between ordering the Bun Bo Hue and a Pho Dac Biet. As always, I let him do the ordering first before I figured out what to have. He settled on the Bun Bo Hue. 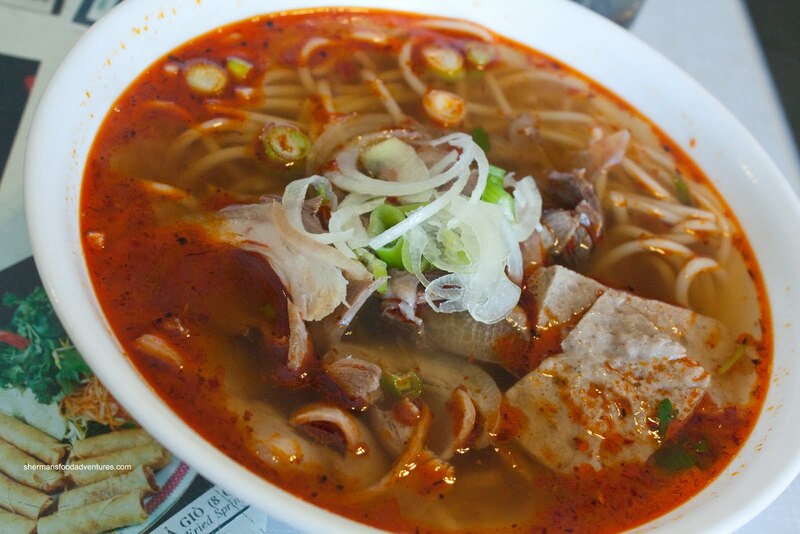 The reason he was having a hard time deciding was due to the bad experiences he's had with Bun Bo Hue. You see, some places merely pour some chili oil on top of regular broth and call it Bun Bo Hue. The version here was somewhere in the middle. There was lemongrass and chili which made it a somewhat flavourful broth but I didn't get a sense of any heat at all. A bit mild for my tastes; but Kaiser Soze seemed to like it. He remarked that the noodles were good while the meats were sufficiently tender. 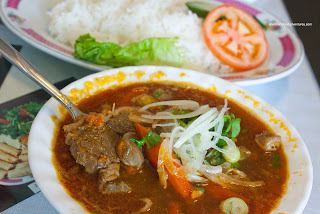 JuJu went for the Com Bo Kho or Spicy Beef Brisket with Rice. We found that it wasn't really all that spicy; in fact, it was rather sweet with a touch of savouriness. JuJu enjoyed it with the rice and used up most of the broth. As for the the beef and tendons, they were super tender and practically melted in my mouth. 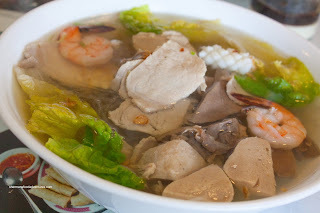 For myself, I wanted something different this time and had the Hu Tieu Dai Dac Biet or clear noodle in soup with pork and seafood. Unlike Pho, the soup here was clear and very light. Now it was light in colour only since it had plenty of flavour. Again, mostly sweet with a bit of aromatics. Although it was sitting in broth, the clear noodles retained its texture. There was a mix of pork, meatballs and offal along with shrimp and squid. I found the pork slices to be slightly chewy while the offal and meatballs to have a nice bounce texture. The shrimp had a good snap while the squid was a tad too chewy. Not a bad bowl of noodles; however, I found it to underwhelming in terms of portion size. And believe it or not, I actually added another order of noodles - the Pho Dac Biet. What immediately struck me was the size once again. With only one size to choose from, it was rather small and I knew I could demolish it even though I had just finished a bowl of noodles. I found the broth to be light while flavourful at the same time. I wouldn't exactly call it a meaty taste; rather it was sweet and a little bit fragrant. There was a modest amount of noodles which were al dente. The small amount of meat was alright. It was mostly tender. Was that all the food we ate after hockey? Heck no! Everyone decided to add a Banh Mi as well. Kaiser Soze had the BBQ Pork, Juju went for the Lemongrass Chicken and I had the lowly Ham Banh Mi. I went for that since there were only 3 choices and the other 2 were taken already. No duplicates! At least for my Banh Mi, I found it be rather bland. No fish sauce, no pate, no mayo, no flavour. The pickled carrot and daikon were not impactful and the lack of peppers didn't help either. At the very least, the bread was light, airy and crunchy on the outside. 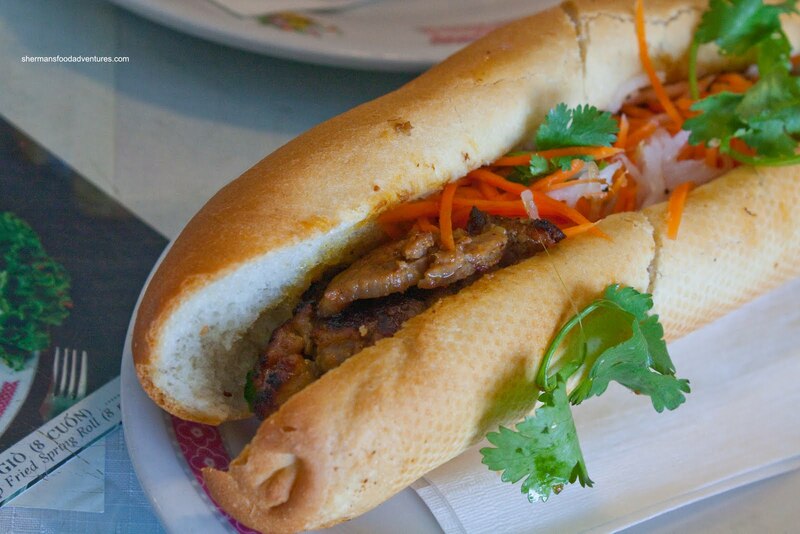 Due to having more flavourful meat, Kaiser Soze and JuJu's Banh Mis were better tasting. And that would be it right? No. JuJu, the eating machine, had an order of the Salad Roll, all to himself. Nothing exciting to report here other than a typical salad roll. 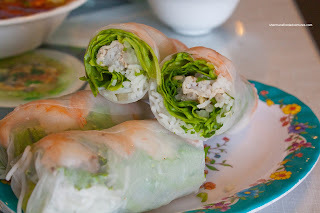 It was rolled tightly and the ingredients were well-balanced and sufficient. The dip was a good mix between hoisin and peanut sauce. In the end, we were satisfied with the eats here. It didn't blow us away; but it was solid. In fact, the one thing that will keep us coming back was the personable service we received. It was noticeably better than most Vietnamese restaurants. I live near this place and we ADORE the staff. We also really really like the food, but dude, it's not a banh mi joint. 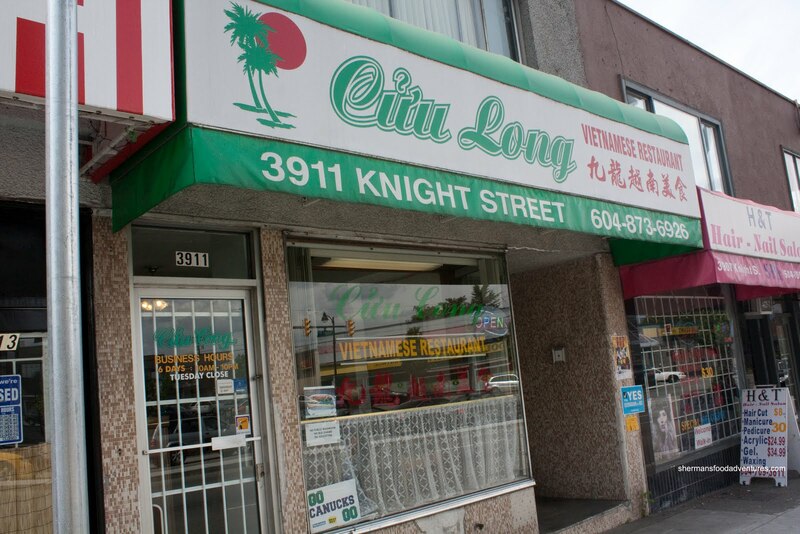 Go down the road to Tung Hing for that. Hey, I love the staff there too, really nice people. Dude, I realize it ain't a banh mi joint, however, it's on the menu and I really can't talk about 10 different bowls of Pho. Also, check my posts on Tung Hing and the rest. Been to most of the banh mi joints already.